"Malin Falkenmark is renowned for her contribution to hydrology and surrounding areas of science in her own country, Sweden, in other Scandinavian nations and across the world. Her achievements within the science of hydrology are many and her substantial reputation has already been recognised by a number of institutions. 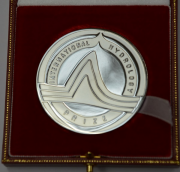 The International Association of Hydrological Sciences is very pleased, along with UNESCO and WMO, to be able to add to her list of honours by awarding her the International Hydrology Prize for 1998 in recognition of her outstanding contribution. Malin Falkenmark started her career as a hydrologist in the Ice Branch of the Swedish Meteorological and Hydrological Institute in 1953. She studied hydrology at the Royal Institute of Technology, Stockholm, and at Uppsala University, rising within the Institute to become a Departmental Director in 1971. In 1978 she became Scientific Secretary at the Natural Science Research Council in Stockholm and in 1986, the Council awarded her a personal chair as Professor of Applied and International Hydrology. She gained the title of Emeritus Professor in 1992. During her work for the Institute and the Council, Malin served on a number of national committees mostly connected with the applications of the science of water and the environment, but some concerned with the wider propagation of knowledge of water and its problems. The journal "Ambio" and the Stockholm Water Conference are two examples of such activities which have benefited from her involvement. The international side of her career has been linked closely to the International Hydrological Programme first as Secretary of the National Committee, then as its Chairman, but also punctuated by membership of several groups of international experts. Perhaps the most prominent landmark in her IHP activities was the initiating and co-editing of the book "Comparative Hydrology" published by UNESCO in 1989, which instituted a new approach to the linkage of land use and water resources, reflecting her research interests on relationships between terrestrial ecology and hydrology. Her other contributions to research deal, in the main, with water scarcity and the likelihood of a global water crisis and particularly with the implications for developing countries. These contributions are reported in some 250 scientific papers and summarised in a number of books. Professor Falkenmark has also contributed to the freshwater activities and programmes of a number of other international bodies such as the International Union for Conservation of Nature and Natural Resources, the World Bank, the Food and Agriculture Organisation, the European Community and the International Water Resources Association. She was Rapporteur General for the UN Water Conference in Mar del Plata in 1977 and she prepared jointly one of the papers which set the scene for the International Conference on Water and the Environment held in Dublin in 1992 as part of the preparations for the United Nations Conference on Environment and Development in Rio de Janeiro. She is scientific advisor to the Global Environment Facility and to the Global Water Partnership. She was involved in the preparation of the comprehensive assessment of the freshwater resources of the world which was presented to the United Nations last year. Professor Falkenmark is a member of Pugwash and she is a Global 500 Laureate. In 1995 she was awarded the KTH Prize of the Royal Institute of Technology in Stockholm, to add to the honours she has already received from several Swedish institutions.